Synthetic biology researchers at Northwestern University, working with partners at Harvard Medical School, have for the first time synthesized ribosomes – cell structures responsible for generating all proteins and enzymes in our bodies – from scratch in a test tube. Others have previously tried to synthesize ribosomes from their constituent parts, but the efforts have yielded poorly functional ribosomes under conditions that do not replicate the environment of a living cell. In addition, attempts to combine ribosome synthesis and assembly in a single process have failed for decades. Michael C. Jewett, a synthetic biologist at Northwestern, George M. Church, a geneticist at Harvard Medical School, and colleagues recently took another approach: they mimicked the natural synthesis of a ribosome, allowing natural enzymes of a cell to help facilitate the man-made construction. The technology could lead to the discovery of new antibiotics targeting ribosome assembly; an advanced understanding of how ribosomes form and function; and the creation of tailor-made ribosomes to produce new proteins with exotic functions that would be difficult, if not impossible, to make in living organisms. Jewett is an assistant professor of chemical and biological engineering at Northwestern’s McCormick School of Engineering and Applied Science. The in vitro construction of ribosomes, as demonstrated in this study, is of great interest to the synthetic biology field, which seeks to transform the ability to engineer new or novel life forms and biocatalytic ensembles for useful purposes. The findings of the four-year research project were published June 25 in the Nature journal Molecular Systems Biology. Comprising 57 parts — three strands of ribonucleic acid (RNA) and 54 proteins — ribosomes carry out the translation of messenger RNA into proteins, a core process of the cell. The thousands of proteins per cell, in turn, carry out a vast array of functions, from digestion to the creation of antibodies. Cells require ribosomes to live. 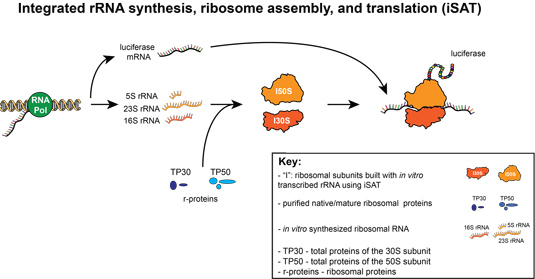 The synthesis process developed by Jewett and Church — termed “integrated synthesis, assembly and translation” (iSAT) technology — mimics nature by enabling ribosome synthesis, assembly, and function in a single reaction and in the same compartment. Working with E. coli cells, the researchers combined natural ribosomal proteins with synthetically made ribosomal RNA, which self-assembled in vitro to create semi-synthetic, functional ribosomes. They confirmed the ribosomes were active by assessing their ability to carry out translation of luciferase, the protein responsible for allowing a firefly to glow. The researchers then showed the ability of iSAT to make a modified ribosome with a point mutation that mediates resistance to the antibiotic clindamycin. The researchers next want to synthesize all 57 ribosome parts, including the 54 proteins. The National Science Foundation, the National Institutes of Health, the Army Research Office, and the Office of Naval Research supported the research. Jewett and Church, a professor of genetics at Harvard Medical School, are authors of the paper, titled “In Vitro Integration of Ribosomal RNA Synthesis, Ribosome Assembly, and Translation.” Other authors are Brian R. Fritz and Laura E. Timmerman, graduate students in chemical and biological engineering at Northwestern. The work was carried out at both Northwestern University and Harvard Medical School.